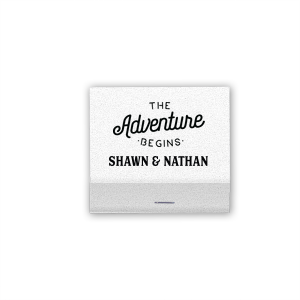 Our Stardream papers have a pearl, iridescent quality that creates a sophisticated look and feel. Smooth, matte finish. Double-sided color. 80lb+ cover stock. 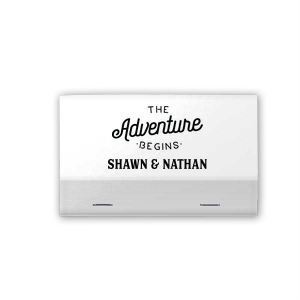 Custom Crystal White Shimmer 30 Strike Matchbook with Matte Black Foil Color has a The Adventure Begins graphic and is good for use in Wedding themed parties and can be customized to complement every last detail of your party.